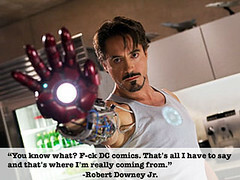 The latest news on the Iron Man sequel is that Terrence Howard just got replaced for wanting too much money. Don Cheadle has been cast to replace Terrence Howard. It seems like a waste of Don Cheadle's Oscar worthy talent. Cast members Robert Downey Jr. and Gwyneth Paltrow have also won and been nominated for Academy Awards. Terrence's Howard's character in the first film had minimal screen time as a military sidekick. Don Cheadle will probably get a chance to fly around in the second suit from the Iron Man lab. Sweet! Terrence Howard is being replaced by Don Cheadle for his role as the best friend in "Iron Man 2" after his negotiation with Marvel Studios failed. According to the Hollywood Reporter's sources, Howard's negotiation with the film studio didn't end up favorably over financial differences. Marvel then approached Cheadle for the role of Jim Rhodes, Tony Stark/Iron Man's best friend. Rhodes is expected get more exposure on the next film. Robert Downey Jr. will be reprising his role as the hero clad in iron suit, and Gwyneth Paltrow will return as Stark's esteemed assistant, Pepper Potts. Jon Favreau will be directing again.